Yes! Day four of the Great (Post) Holiday Give is a new reprint from Purple House Press of the classic Gus Was a Friendly Ghost. One day, during a walk, he met Mouse, who was cold and hungry. "Come spend the winter at my house!" cried Gus. Thus begins an unlikely but heartwarming friendship. 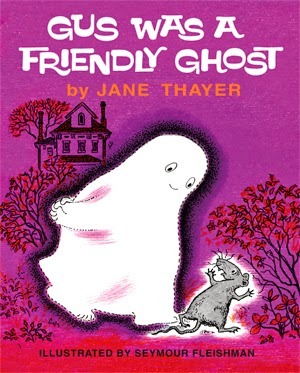 First published in 1962, children have delighted in this story and other Gus the Ghost books for over fifty years. Seymour Fleishman's sweet, nostalgic illustrations bring Gus, the Scotts and Mouse to life. So without further blah blah, I will be giving away one copy of this sweet, spooky book. To be entered to win a copy, simply comment on this post by 11:59 PM CT Wednesday, January 7. The winner will be announced the next day!!!! The Great Holiday Give will run through Wednesday so be sure and check back each day to find out about a new vintage reprint and enter to win a different book. Good luck! Ah, I had this book! I wonder if I still have it. Memories...! My comment is that I didn't even realize this was a giveaway at first! I was so excited to see the cover I didn't read the entire post. Anyway, wonderful blog and thanks. We have Gus and the Baby Ghost! I'd love this one. I had Gus Was a Mexican Ghost! Great memories. I'd love to win this one. Thanks for the chance! This looks like a sweet book. Love to read it to my grandchildren. Awesome! I'm sure my kids would be so excited to read this. This also looks like a wonderful read! Thanks so much for the memory as well as the giveaway! The sight of this cover takes me back to my childhood library! Oh, Gus! My girls love him and this is one of his books that is not already in their collection! I absolutely loved this book when I was a kid. The illustrations are timeless and the story is so sweet.